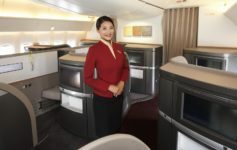 Home » cathay pacific » Cathay Pacific Will HONOR Cheap Business/First Class Fares! Cathay Pacific Will HONOR Cheap Business/First Class Fares! Cathay Pacific will honor deeply-discounted business and first class fares briefly available on New Year’s Eve. I predicted Cathay Pacific would honor the fares because of the recent data breach, similar move from Hong Kong Airlines, and because it was the right thing to do. And indeed, Cathay Pacific did the right thing. For this, I congratulate them. I also truly understand that this is going to hurt, especially when some really took advantage of the deal. For example, my friend Gene left a note on One Mile at a Time that he purchased 34 first class tickets! Cathay Pacific did not disclose how much “damage” was done. But, the carrier stated that this was a mistake fare rather than an intended sale. Perhaps that was obvious enough when $20K first class fares were on sale for only $1K, but I maintain it should not be on the consumer to determine what fare is valid and what is not. Under both Hong Kong and U.S. law, Cathay Pacific could have declined to honor the fare. They did not, and I salute them for that. Congrats once again to all who took advantage. What a shame I slept through it! Will Cathay Pacific Honor First Class Fare Deal? 34 first class tickets mean $34,000. Having miles is great but having cash is better, even if the tradeoff was so compelling. They’ve got a second home in Hanoi. My guess is 34k is a drop in the bucket. Kudos to CX for honoring the fare especially since they’ve had a loss the past 2 years. I didn’t take advantage of the deal but then again I was with friends and family evening of Dec 31st not even thinking of going to BoardingArea or checking FlyerTalk to find out about this deal. Ah well. I took advantage of a mistake fare once. I didn’t enjoy the experience very much: it was a bit anxiety inducing not knowing for a long time if they would honour it or not ( and if they didn’t , implications for positioning and replacement flights). Probably great for someone who needed the exact route/timing. Or for someone looking for the F experience for the first time and able to make a great vacation out of it. But this one was such great value that I would have jumped on it ; sadly didn’t see it in the brief window it was open.